A Profile On Bamyan Civilization. Afghanistan is called the heart of Asia, while Bamyan is the heart of Afghanistan due to its rich cultural civilizations and even for its important geographical location. In the ancient times Bamyan was the nearest link road between Central Asia and the Subcontinent. Bamyan has been mentioned in Chinese as FAN-YAN or FAN-YENNA and in Pehlavi (Old Persian) as BAMIKAN (1). Bamyan has not been merely recognized because of its Buddhist civilization in the world, but the characteristics of many other ancient civilizations are also found there. Among these, most famous name is ruins of the city of ZOHAK (MARDOASH) which was considered the biggest city of its time (2). According to reliable historical evidences after the ritual congregation at PATNA (India) in 247 BC, the great ASUKA (3) sent three Buddhist monks DHAMMARAK-KHITA, MAJAHAN-TIKA and MAHARAK-KHITA for preaching to GANDHARA, Afghanistan and other countries. 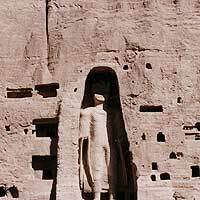 During that era an important "stupa" (4) was built in Bamyan. Later on, during the period of great Kaniska (5) the most famous ruler of Kushan dynasty (6) the Buddhist sect MAHAYANA got developed and thus the golden age of stone carving were started. In that period Bamyan was selected due to its geographical importance and best geological characteristics, and the work of carving of statues and caves was started. According to well-known French Archaeologists J-Hacking, Mr. &. Mrs. Godard who visited Bamyan in 1922 and 1924, the first statue of Buddha (35 meter high) locally known as "SHAMAMA" was carved during the 1st century AD. At the time the art of stone carving was not advanced and developed, so they carved an other improved statue 600 meters away form the 1st locally known as "SALSAL" which is 53 meters high, (2nd and 3rd century AD) the largest statue in the world. It is considered the most beautiful masterpiece in the art of Sculpturing. Besides that, there were two smaller statues in the meditating position (10 meters each), which were later on destroyed but still the places and signs are visible between these two grand statues. Around these two statues hundreds of smaller and bigger caves have been made, probably for Monks and special guests. Most of these caves had been painted which can be seen obviously. In its bloom period, no doubt Bamyan was one of the most sacred and holy places for the Buddhists all over the world. Buddha's followers used to visit there every year for ritual purposes. Moreover, Bamyan played the role of the main and nearest link road between the Central Asia and Sub Continent. Therefore, at that time thousands of trade caravans were using Bamyan as junction. For accommodations of these thousands of people some twelve caves were made in FOLADI and KAKRAK passes (10 km away east form main Bamyan Valley) (7). According to the history, at first in 6th century AD, the White Huns damaged this civilization and after getting revival to some extent, later on the Muslims thoroughly annexed the whole region up to 9th AD. Then they rooted up the Buddhism. The Muslims however didn't much damage except chapping the faces of Buddha's Statues. After them the great Mongol warrior Genghis Khan also came in the region in 1221 AD, and during long besiege of Bamyan city his beloved grand son MOTOKUN was killed by the Hazaras, so Genghis army destroyed the whole famous city GHULGHUL of Bamyan and its surroundings in revenge, but he did not touch any of the statues or painted caves because he had a soft corner towards Buddhism. During the modern era of Afghanistan this historical heritage was badly damaged during the regime of Amir Abdul Rahman (1880-1901) when Amir conquered this region after a long and sever battle with the Hazaras (1880-1893). He not only killed and forced thousands of Hazara to migrate but also destroyed the whole historical Heritage, specially the Heritage of Bamyan which belonged to the Hazaras, in revenge. King Amanullah (1919-1929) was the first ruler of Kabul who came to know about the importance of this historical heritage and declared the value of the national heritage of Afghanistan. At first he removed Surrais (hotels) away form the statues, and made vacant the caves by the occupied people and their cattle. Later on he invited French archaeologists for chronological survey of this historical site. Unfortunately after King Amanullah, other Afghan rulers like Nadir Shah, Zahir Shah and Sardar Dawood Khan on political reasons once again put this historical site in complete ignorance. After long time pro-Moscow regime paid attention to the protection of this heritage with the help of UNESCO, but this process was stopped due to civil war in Afghanistan. In 1990 the whole province of Bamyan was annexed by Hezb-e-Wahdat (Hazara party) knowing the importance and value of this historical heritage. Hezb-e-Wahdat put full attention towards this site. The Old Bazar, which is lying beside the heritage, was being shifted gradually away from the site. The New GHULGHUL BAZAR remained incomplete due to occupation of TALIBAN. A directorate had been established by Hezb-e-Wahdat under the supervision of Mr. Safwat, but not having sufficient resources, they could not make any major steps towards the protection and preservation of the whole heritage. They did some positive steps towards the safety of the site. Like preventing illicit and unruly digging and encroachments of dwellers. In May 1997 the Taliban commander Mullah Wahid raised statement that after having held Bamyan city the whole heritage would be blown-up. At that time they did several attacks on Bamyan city. 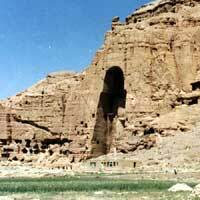 Due to the Taliban bombardments, the conglomerate floor which lies above the great statues arch, had been cracked. After one year, in September 1998 when the Taliban held the Bamyan Valley, they made good on their earlier statments and fired several rockets on the Giant Buddha's statues (8) Even though they were told not to damage these giant statues (a cultural and historical heritage of human being specially the people of Afghanistan) by the secretary General of UNO an other well known world leaders. No doubt that no one can deny the importance of this human grand civilization, which is considered to be the level of Egyptian civilization. But Unfortunately the Taliban is trying to ruin this human heritage on fanatic and prejudicial basis because it is beloved that the two Giant Buddha's where built and growthed Bamyan civilization by the Hazaras. Bamyan known a capital city of Hazarajat and having known as a heritage of Hazaras, Taliban representative of fanatic Pushtun historic and racial enemy of Hazaras are trying to destroy this human heritage on the basis of racial and religious prejudices. The Taliban leaders issued a religious edict deeming the two of the World's tallest Buddha Statues, which are carved into a mountain, as non-Islamic and ordered their destruction. The Taliban are supported by their masters - the Pakistan army and Saudi Royal family. Islamic scholars all over the world have condemned this decision and act of barbarism. The 2000 year old Buddha Statues were believed to have been carved during the time of the Kushan dynasty which are believed to be the ancestors of the Hazara tribe that inhabits Bamyan, the heart of Hazarajat region. Please follow this link to the News Archive to read more about it. 1. ASAR-E-ATHEQA-E-BAMYAN DAR HAZARISTAN written by Andre Godard, translated in persian by Ahmed Ali Khan. Published in Iran. 1372 H.S.H (1993 A.D) PAGE NO= 24&158. 3. ASHUKA - was the grand son of great Chandra Guptha Muria, the founder of Muria dynasty who freed the whole territory of ancient India and became the king in 273 B.C. Ashuka embraced the Buddhist religion and became one if the most active preacher of Buddhist religion. The most well known conqueror and powerful king of Kushan dynasty, the vast area of his reign was from Oxis River to Gangies and Sind River to TARUM River of KHATAI (CHINA). 6. The Kushnis were Yuechis who had been driven to the land south of the OXIS river (today's Afghanistan's Northern boundary) following tribal wars although the Kushnis Empire collapsed in the Northern Hindukush in 220 A.D. They continued ruling in southern Hindukush until 425 A.D.
8. An article by Pakistani Talib Militant Ahmed Khan Kamrani, Published in November 30, 1998, in Daily MUSHRAQ in Quetta, Pakistan And November 15, 1998, in Daily DAWN Karachi, Pakistan.